A journal tool should be simple, and easy to use. Writing a daily journal is all about the content. It's not about tagging, categorizing, cross linking and etc.. That's what blogs, wikis and note taking tools are for. Plain Text Journal is different. It's just you and your writing. The interface supports the bare minimum features. Personal journals are long term affairs. Most people keep them for many years. It makes no sense to trap all that content in some database, or proprietary file format. 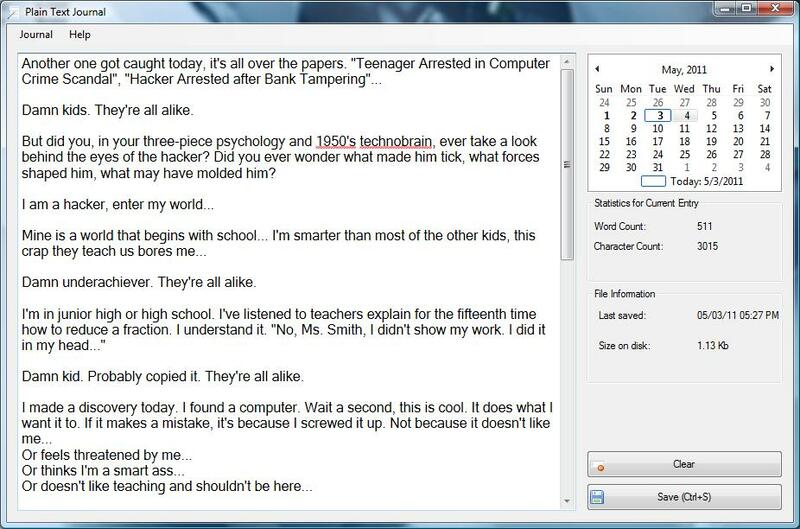 Plain Text Journal saves your entries in plain text. It is a tool that helps you to navigate, organize and create new entries, but at the end of the day it's all just text. You can go back and edit your entries with any text editor at any time. Plain Text Journal was written in C#. You will need Microsoft .NET Framework 3.5 or better to run it. The project was created using Microsoft Visual C# 2008 Express, and the repository includes all the project files for your convenience. You should be able to open and compile the project in any version of Microsoft Visual Studio. Download sedup.exe and install Plain Text Journal on your system. Download the stand alone binary and run it from anywhere. This program is free software; you can redistribute it and/or modify it under the terms of the GNU General Public License as published by the Free Software Foundation; either version 3 of the License, or (at your option) any later version. This program is distributed in the hope that it will be useful, but WITHOUT ANY WARRANTY; without even the implied warranty of MERCHANTABILITY or FITNESS FOR A PARTICULAR PURPOSE. See the GNU General Public License for more details.